Though this had been floating around a little bit in the past as a rare experimental beer that a lucky few got a sample of here in there it was officially introduced earlier this summer. It's name is in tribute to ArtPrize, the world’s largest art competition held annually in Founders home base of Grand Rapids, Michigan and it's limited batch run that was sold in the Mitten State only proceeds are going to benefit ArtPrize's future competitions. 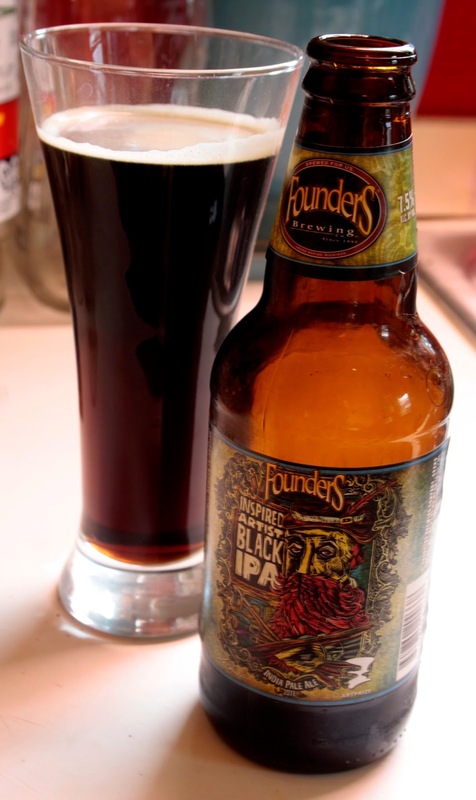 The brew pours almost black in color but when held up to the light shows off a dark crimson in color. The medium soft pour brought out a minimal head but what is there leaves a pretty solid cap and ring that holds tight and leaves drifts of lacing all the way through the drinking session. Roasty malts, a bit of maple wood smoke, bakers chocolate and more than a touch of the aroma that is standard for Founders other IPA's come out on the nose. None of the scents are aggressive and have a muted but pleasant relationship going on. The taste is right along the lines of the smell but all much more pronounced. The first thing in medium & creamy weight in mouth feeling beer is the flavor is something of a less sugary Nutella. You know what I am talking about. Hazelnuts & cocoa happening. Since I am not one to ever turn down some Nutella-I am already charmed as soon as it hits the taste buds. That is followed by a hint of charred wood which then gives way to some grapefruit tang. It finishes with a mix of dark coffee bitters and lingering citrus with the 7.5% alcohol being pretty well hidden. My experience with some other black IPA's have been hit or miss but this one hits it not only out of the park but the ball is found 3 blocks away from the park when it finally lands. Been hoping that I could find another six pack somewhere (because sometimes there is that rare stroke of luck locating a stash in a out of the way store that doesn't realize what it has) but all I got from clerks were a chuckle and a "Yeah, good luck with that, Bub" in a scoffing tone. I don't know if Founders plans on releasing this every year but one can wish so wish I do.